Yes, it’s strange but true – lawn maintenance companies really can elevate your social status! But how? Well, the first thing you do is hire not just any lawn maintenance company, but the right one. After all, you want your lawn maintenance company to care for your yard even better than you could. Still not convinced? Here are three surprising reasons why having a lawn care service around can make you the neighborhood’s next best thing since the favorite local pizza shop opened down the street. A great looking lawn naturally compliments a house with impressive curb appeal. It communicates to the viewer that the house looks just as beautiful inside as it does outside. In fact, landscaping can improve the value of your home by up to 1,000 percent of your return on investment! How? Hire a great landscaping company – paying for the service costs much less than having to do the landscaping yourself. It sounds like we’re stretching it a bit? Maybe we are. But, then again, maybe we’re not. Think about it: A well-manicured lawn tells your neighbors that you care about your home, and it gives off the appearance of a higher social status. Having a lawn maintenance company taking care of your place communicates that you manage your time and money wisely. Your time is your most valuable asset, because once it’s spent, it can’t be replaced. So, why spend your time fussing with dirt, equipment, and chemicals when someone else can do it for you and free you up to do what you’d rather be doing? Who doesn’t like a lush green lawn that you can have a cookout at and your kids and pets can frolic around on every weekend? 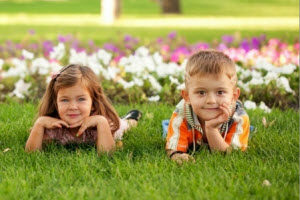 With a little foresight and planning, you can team up with a lawn maintenance company like us to improve your yard just in time for the summer. Then, invite your neighbors over for a backyard barbecue! They’ll appreciate your hospitality – and your lawn – and you’ll become known as the hosts with the most in your neighborhood. Are you ready to become a neighborhood celebrity this year with lawn maintenance companies? Contact us at Think Green Lawn Service today! Our dedicated staff takes pride in going beyond the standard with each customer we serve. You can reach out to us by phone at (678) 648-2556, or fill out our simple online form anytime to schedule a free estimate. Plus, you’ll get 50% off your first appointment with us – a great way to start the season right!